Before subsetting B cells, steps must be taken to ensure dead cells, cell aggregates, and debris are not confounding the analysis. First, to remove cell aggregates, a singlets gate must be created using the forward scatter (FSC) or side scatter (SSC) parameters. Depending on the cytometer used to acquire data, they may be identified by plotting FSC-area by FSC-width or –height. Next, dead cells must be removed from the population of interest. Staining the cells with a cell non-permeable dye allows for detection of dead cells. The dye is only able to bind to dead and dying cells that have lost cell membrane integrity. Finally, B cells are CD45+ and typically have a lower FSC and SSC profile typical of most lymphocytes. Once analysis has isolated the live, CD45+ singlets, the cell population can begin to be broken down into subsets. Most B cells are CD19+ and B220/CD45R+, however, it should be noted that plasma cells and plasmablasts can downregulate CD19 and B220 expression. Positive expression of the markers CD138 and TACI should be used to identify plasma cells and plasmablasts, with intermediate expression of B220 being used to indicate proliferating plasmablasts1. Within the CD19+ population, many other B cell subsets can be identified. Before elaborating further, it should be noted that B cells can be found in most tissues in the body, but the markers and size of B cell subset populations may vary from tissue to tissue. Thus, it is important to investigate what is already known in your tissue of interest before finalizing your panels. One B cell subset that can be identified in most tissues is the B1 cell subset. B1 cells are CD19+ and B220low-negative. They are also CD43+ and CD23- and may also be IgM+. B1 cells can be further subsetted into CD5+ B1a and CD5- B1b cells2,3. Within the spleen, there are many different B cell subsets including follicular (Fol), marginal zone (MZ), and transitional B cells. All of these cells are CD19+B220+ and transitional B cells can be subsetted by their positive expression of CD93. Transitional B cells can be further subsetted into T1, T2, and T3 cells as indicated by IgM and CD23 expression. T1 cells are IgMhigh CD23-, T2 are IgMhigh CD23+, and T3 are IgMlow CD23+4,5. Fol and MZ B cells are CD93- and can be distinguished from one another by CD21/CD35 expression. MZ B cells are CD21/CD35+ as well as IgM+, CD23-, and IgDlow. It should be noted that MZ precursor cells are IgDhigh and CD23+ 4,5,6. Fol B cells are CD21/35neg-low, IgM+, CD23+, and IgDhigh. These cells can be further subsetted into Fol I cells, which are IgMlow, and IgMhigh Fol II cells4,5,6. Marginal Zone and Follicular B-2 Cells in Mouse Splenocytes. (A) C57BL/6 mouse splenocytes stained with a PE-conjugated Rat Anti-Mouse CD19 Monoclonal Antibody ( NBP2-24966) and an Alexa Fluor 488-conjugated Rat Anti-Mouse CD43 Monoclonal Antibody ( NBP1-43413AF488). CD19+/ CD43- cells were gated. (B) Follicular B-2 cells (CD19mid/CD1dmid/CD23+/CD21low/CD43–) and marginal zone B-2 cells (CD19mid/CD1dhigh/CD23–/CD21high/CD43–) were detected in the CD19+/CD43– population by staining with a fluorochrome-conjugated anti-mouse CD21 monoclonal antibody and an Alexa Fluor 700-conjugated Rat Anti-Mouse CD1d Monoclonal Antibody (NBP1-43461AF700). CD1dmid/CD21low and CD1dhigh/CD21high cells were gated. (C) Follicular B-2 cells (CD1dmid/CD21low) and marginal zone B-2 cells (CD1dhigh/CD21high) were stained for CD21 and CD23 using a fluorochrome-conjugated anti-mouse CD21 monoclonal antibody and an Alexa Fluor 594-conjugated Rat Anti-Mouse CD23/ Fce RII Monoclonal Antibody (FAB6900T). 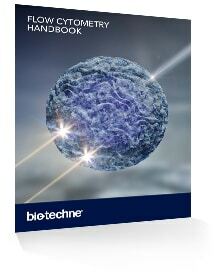 Finally, there is an additional subset of B cells known as B regulatory cells (B regs). It has been proposed that B cells throughout B cell development can be induced to differentiate into B regs, thus using cell surface markers to identify this subset is difficult. Rather, B regs are identified by their expression of IL-10, TGF-beta, and IL-35. To detect expression of these cytokines by flow cytometry, cells must be treated with monensin prior to antibody staining in order to inhibit secretion of these cytokines 8. 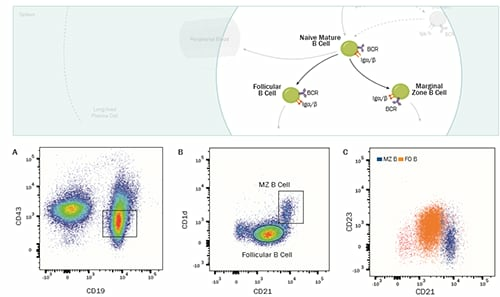 Identifying all of the aforementioned B cell subsets using a single flow cytometry panel may be challenging without access to cytometers capable of detecting upwards of 15 to 20 different fluorophores. Furthermore, antibodies conjugated to 15+ distinct fluorophores must be available. These factors and those mentioned earlier are all important to keep in mind when planning experiments to identify and analyze B cell subsets. Victoria studies cellular mechanisms regulating vascular growth during peripheral artery disease and obesity.